The Solid State Ignition (SSI) system features a solid state Ignition Control Module (ICM)/ignition coil assembly, Electronic Control Unit (ECU), distributor and engine speed sensor. Other components include the battery, ignition switch, starter solenoid, spark plugs and wires, cap and rotor, resistance wire, by-pass wire and a knock sensor. A sync pulse signal generator (stator) inputs the firing order to the ECU. The ignition control module is mounted to the ignition coil. See Fig. 2. Based on control system inputs, the ECU triggers the ignition coil via the ignition control module. The ECU is able to advance or retard ignition timing by controlling the ignition coil through the ignition control module. The ICM consists of a solid state ignition circuit, an integrated ignition circuit and an integrated ignition coil that can be removed and serviced separately if necessary. Electrical feed to the ICM is through terminal "A" of Connector No. 1 on the module. See Fig. 3. 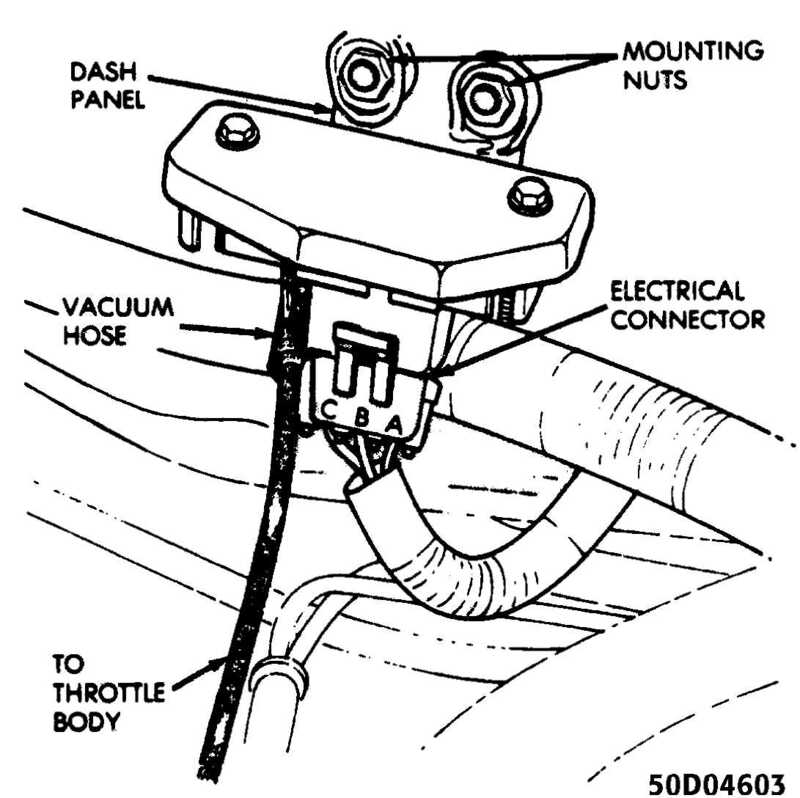 NOTE: Electrical supply only occurs with the ignition switch in the START and RUN position. Fig. 3: Ignition Control Module Connector Identification Courtesy of Chrysler Motors. Terminal "B" of Connector No. 1 is grounded at the engine oil dipstick bracket along with the ECU ground wire and Oxygen (O2) sensor ground. The tachometer output signal wire of the ICM is connected to Pin No. 1 of the "D1" Diagnostic connector. 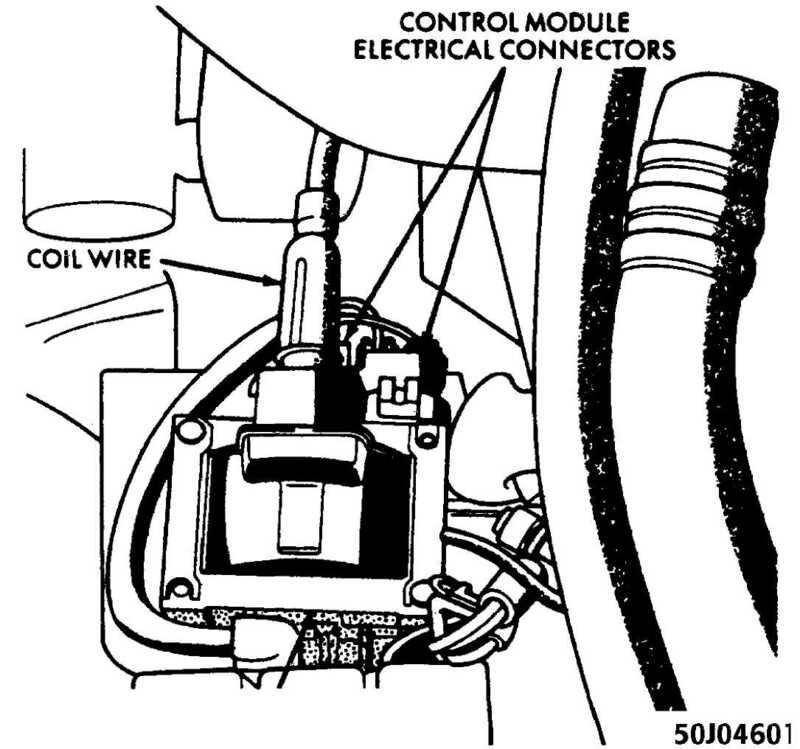 The wire is routed to the diagnostic connector through a short section of the ECU harness, the engine, and the instrument panel harness. This type of routing eliminates any potential electrical interference from occurring in the various ECU circuitry. transmitted through terminal "B" of Connector No. 2 on the ICM. the ignition signal from the ECU is received by the ICM in the form of a 5 volt square wave. As the leading edge of the wave contacts the ignition circuitry in the ICM, the ICM charges the coil primary windings. When coil saturation occurs, the module circuitry opens the primary windings to collapse the magnetic field in the windings. This induces the coil secondary windings which is then transmitted to the spark plug via the coil wire, distributor cap, and rotor. The MAP sensor reacts to absolute pressure in the intake manifold and provides an input signal to the ECU. As the engine load changes, manifold pressure varies, which causes the MAP sensor resistance to change, resulting in a different input voltage to the ECU. The input voltage level supplies the ECU with information relating to ambient barometric pressure during engine start-up or regarding engine load while the engine is running. The ECU calculates this information and adjusts the air-fuel mixture accordingly. The MAP sensor is mounted under the hood on the firewall and is connected to the throttle body with a vacuum hose. See Fig. 4. Fig. 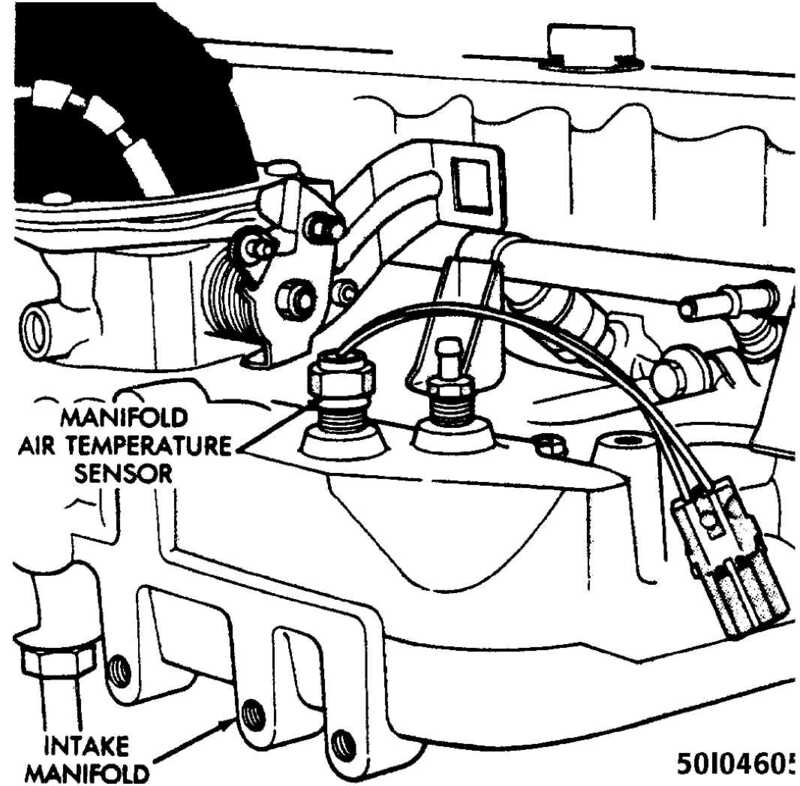 4: View of Manifold Absolute Pressure (MAP) Sensor Courtesy of Chrysler Motors. Compensate for fuel condensation in the intake manifold. Control engine warm-up idle speed. Increase ignition advance when the coolant is cold. of vacuum to the EGR valve. Fig. 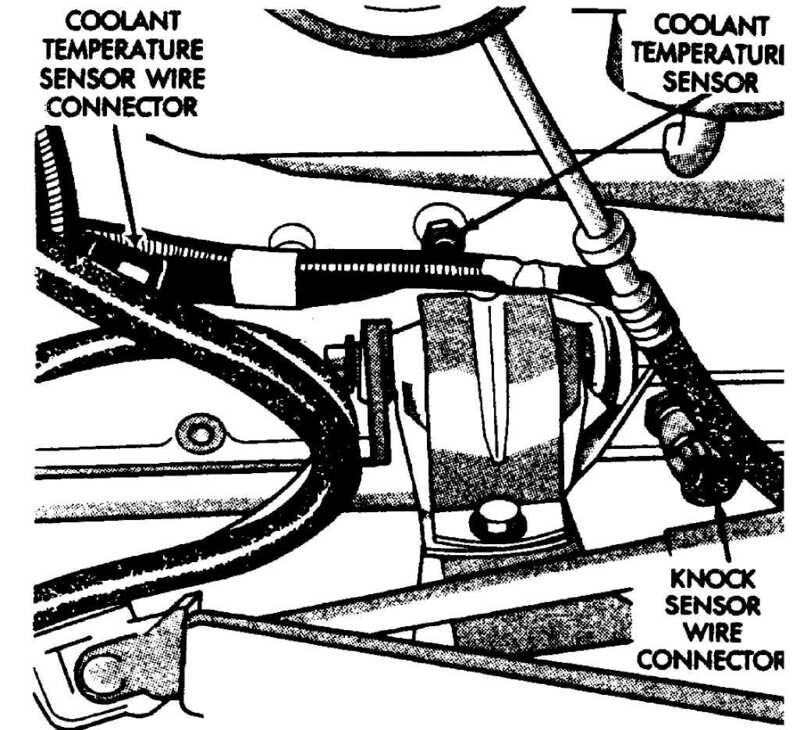 5: Location of Coolant Temperature Sensor (CTS) Courtesy of Chrysler Motors. stream See Fig. 6. The MAT sensor provides an input voltage to the ECU. As the temperature of the air-fuel stream in the manifold varies, resistance changes, resulting in a different input voltage to the ECU. Fig. 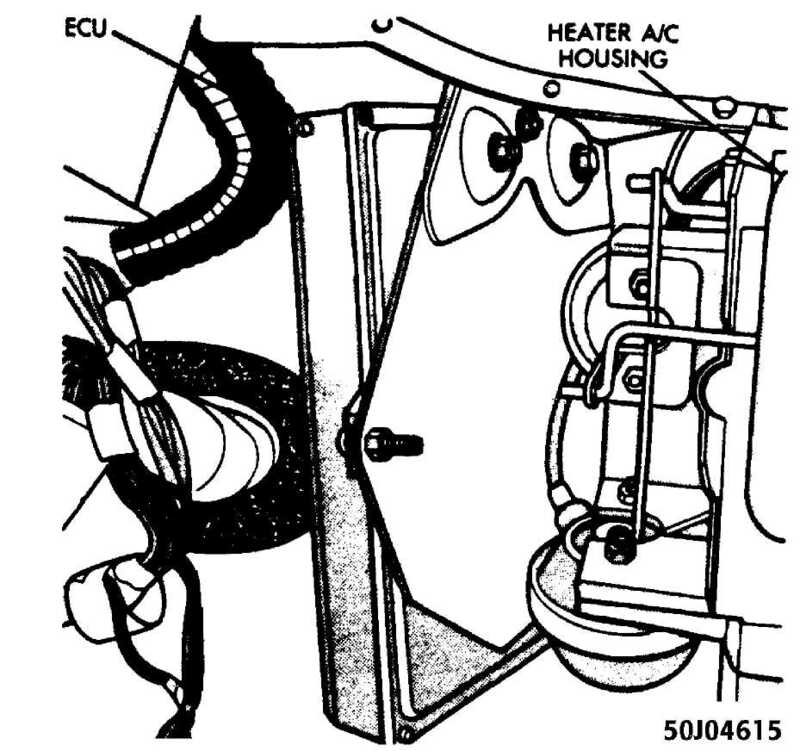 6: Location of Manifold Air Temperature Courtesy of Chrysler Motors. position. The engine speed sensor senses TDC, BDC, and engine speed by detecting the flywheel teeth as they pass by the sensor during engine operation. The engine speed sensor is non-adjustable. 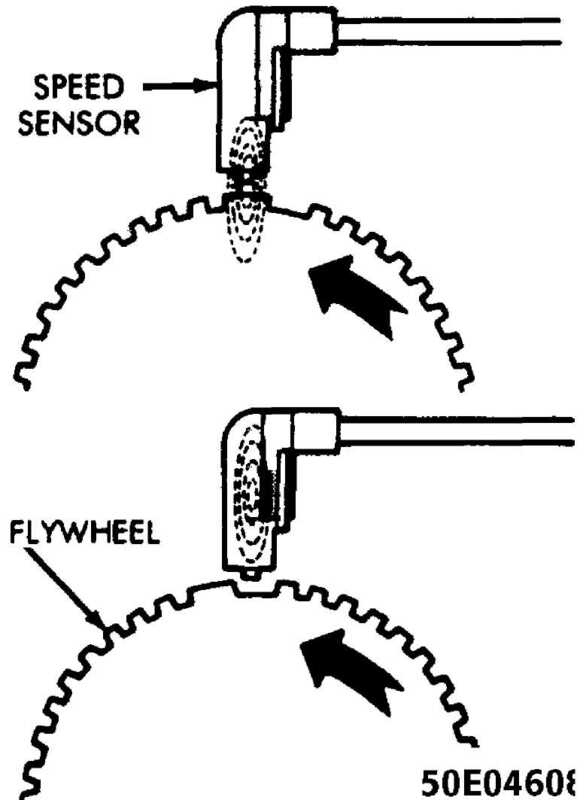 The flywheel has three trigger notches, 120 apart. See Fig. 7. There are 20 small teeth between each trigger notch. Each large trigger notch is located 12 small teeth before each Top Dead Center (TDC) position of the corresponding pistons. Fig. 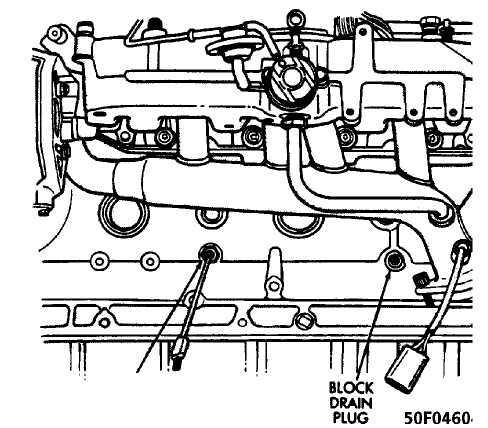 7: Location of Engine Speed Sensor Courtesy of Chrysler Motors. flux induces a small voltage spike to the sensor pickup coil winding. These small voltage spikes enable the ECU to count the teeth as they pass the sensor. When a large trigger tooth and notch pass the magnetic core in the sensor, the increased concentration, and then collapse of the magnetic flux induces a higher voltage spike into the sensor pickup coil winding. See Fig. 8. Fig. 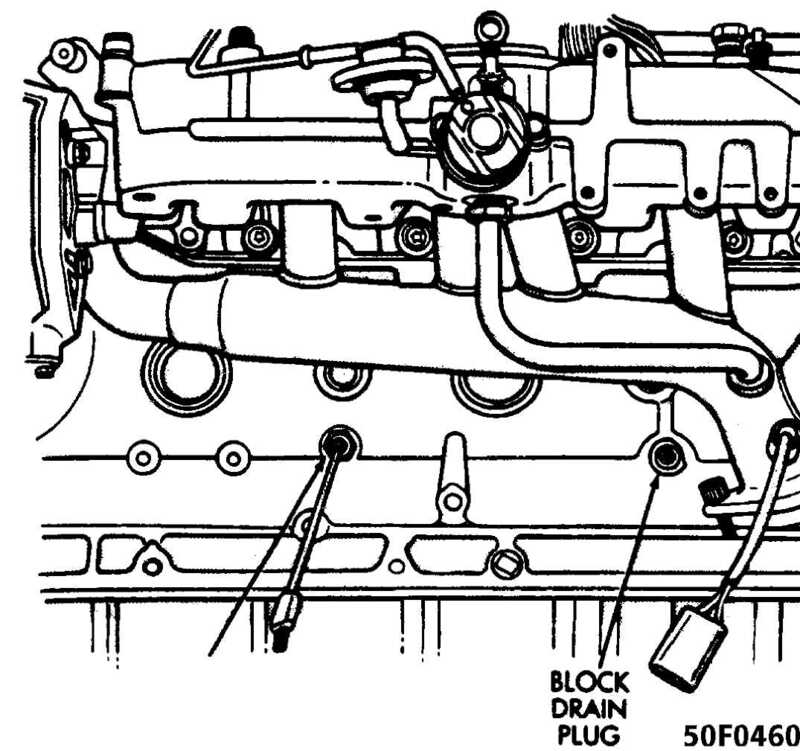 8: Engine Speed Sensor Operation Courtesy of Chrysler Motors. ignition timing for the particular cylinder is either advanced or retarded as necessary by the ECU according to sensor inputs. The sync pulse signal generator is located in the distributor and works in conjunction with the engine speed sensor to provide the ECU with input to establish and maintain correct injector firing order. See Fig. 10. 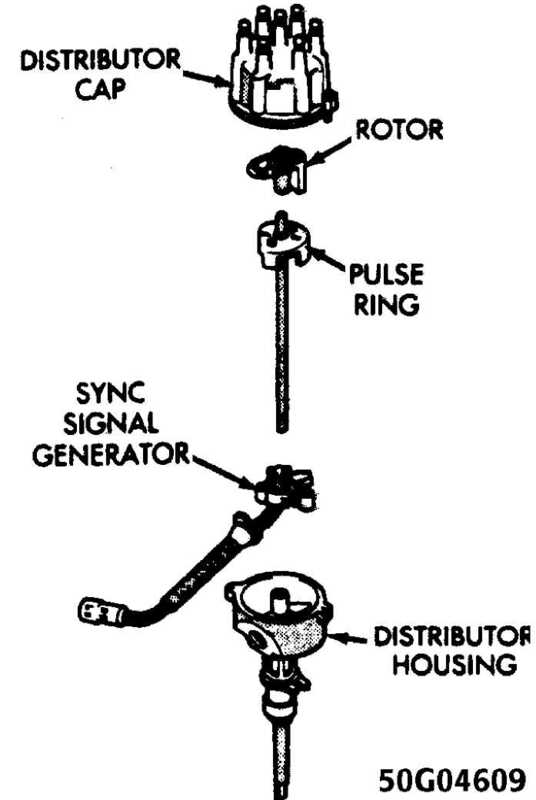 A pulse ring mounted to the distributor shaft references the position of pistons one and six as it rotates through the sync pulse signal generator’s magnetic field. Fig. 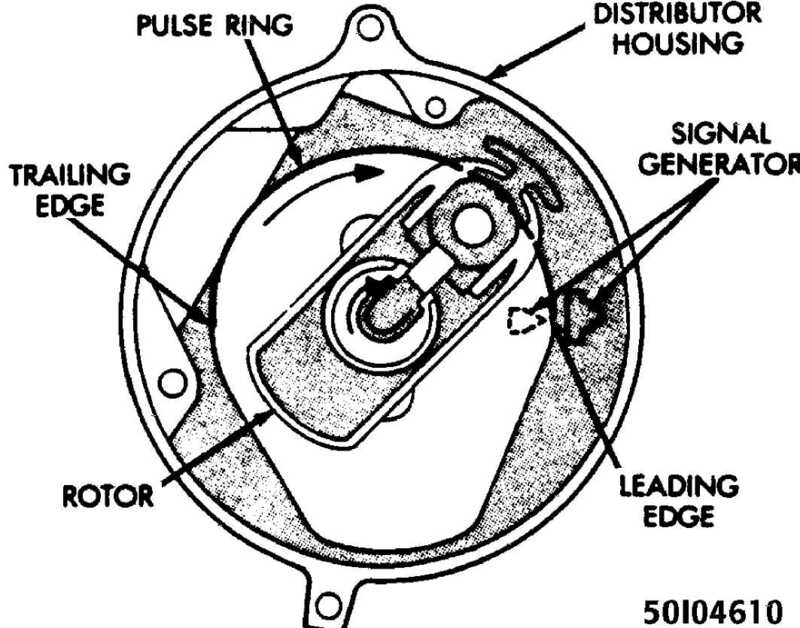 10: Location of Sync Pulse Signal Generator & Pulse Ring Courtesy of Chrysler Motors. pulse signal generator, the magnetic field becomes weaker. 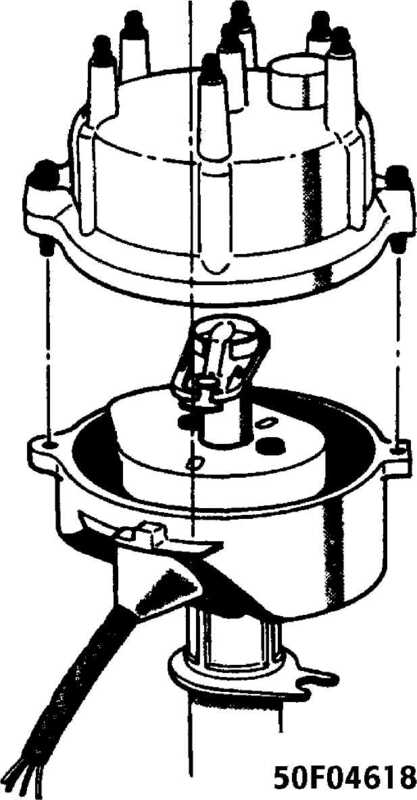 This indicates the position of piston number one to the ECU. When the trailing edge of the pulse ring leaves the sync pulse signal generator, the magnetic field becomes stronger. This indicates the position of piston number six. The sync pulse signal input and engine speed sensor input allow the ECU to establish the necessary reference point to synchronize the fuel injection. Fig. 11: Sync Pulse Signal Generator Operation Courtesy of Chrysler Motors. The knock sensor is located on the lower left side of the engine block just above the oil pan. See Fig. 12. 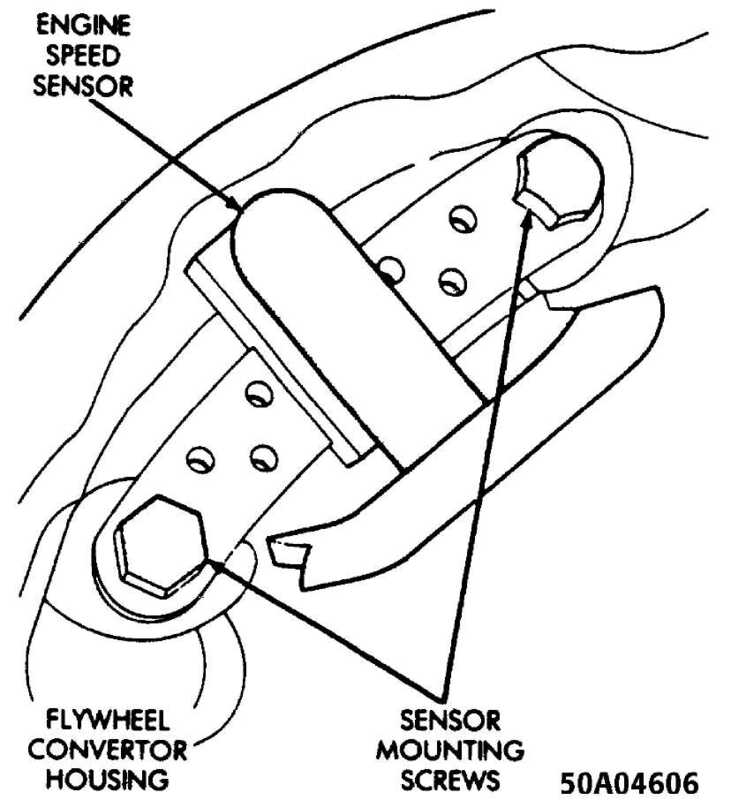 The knock sensor provides an input to the ECU, indicating detonation (knock) during engine operation. When knock occurs, the ECU retards the ignition advance to eliminate the knock at the appropriate cylinder(s). Fig. 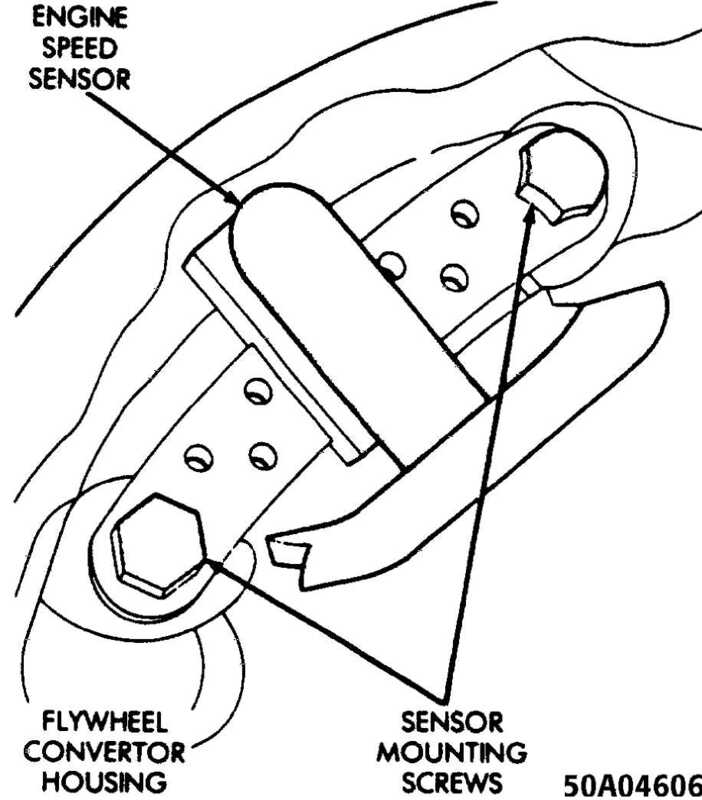 12: Location of Knock Sensor Courtesy of Chrysler Motors. When disconnecting wire from spark plug or distributor cap, twist rubber boot slightly to loosen. Grasp boot (not wire) and pull with steady, even force. When separating control unit connectors, pull with firm, straight force. Do not pry apart with screwdriver. When connecting, press together firmly to overcome hydraulic pressure of silicone grease. If connector locking tabs weaken or break, press together firmly and bind with electrical tape or a harness tie strap to assure good connection. This section contains information for determining individual system component performance. Diagnosis of ECU/Engine Control System is performed using the DRB-II Diagnostic Tester. See the appropriate Computerized Engine Control System article in this section. 1) Disconnect the CTS wire harness connector from the CTS. See Fig. 13. Fig. 13: Location of Coolant Courtesy of Chrysler Motors. with a warm engine. See the COOLANT TEMPERATURE SENSOR (CTS) RESISTANCE VALUES table below. the table, replace the coolant temperature sensor. 1) Disconnect the MAT wire harness connector from the MAT sensor. See Fig. 14*. Fig. 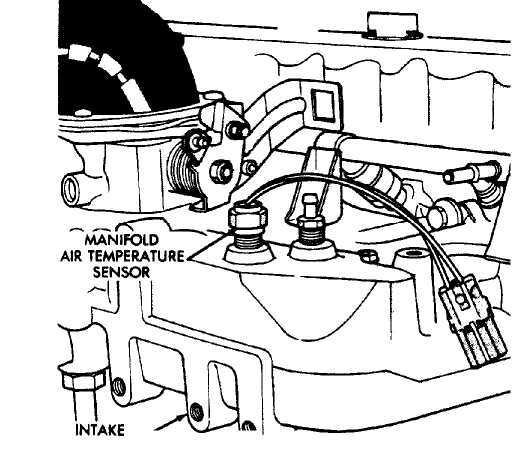 14: Location of Manifold Air Temperature (MAT) Sensor Courtesy of Chrysler Motors. with a warm engine. See the MANIFOLD AIR/FUEL TEMPERATURE (MAT) SENSOR RESISTANCE VALUES table below. the table, replace the MAT sensor. 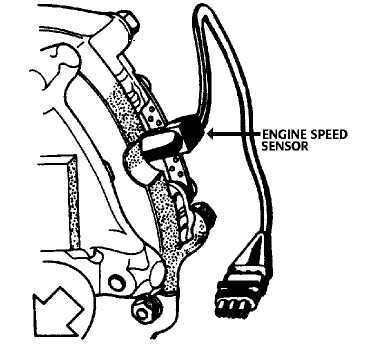 1) Inspect the MAP sensor vacuum hose connections at the throttle body and the MAP sensor. See Fig. 15. Repair vacuum hose or connections as necessary. Fig. 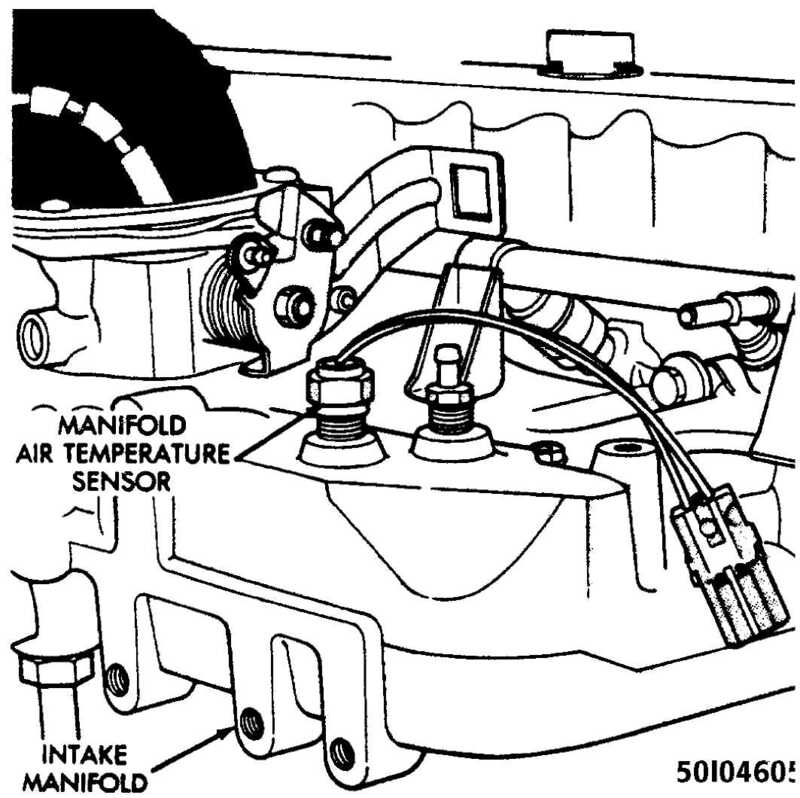 15: Manifold Absolute Pressure (MAP) Sensor Connectors Courtesy of Chrysler Motors. Fig. 15. With a hot idle condition, the voltage reading should drop to between 0.5-1.5 volts. in step 2) to verify the wiring harness. Repair as necessary. Repair or replace the wire harness as necessary. verified to be good, check for a short to 12 volts at terminal "D-3". If a short is found, repair the short and then replace the ECU. Connect Diagnostic Tester M.S. 1700 to the vehicle. Go to "State Display" mode. Start the engine and let idle. 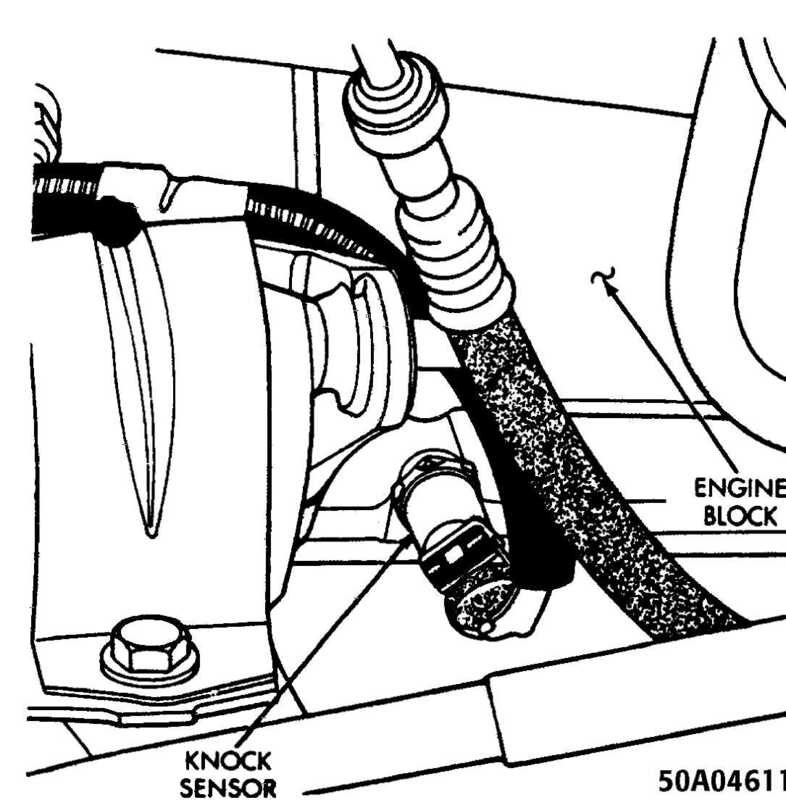 block near the sensor while observing the knock sensor value. the knock sensor. Refer to REMOVAL & INSTALLATION in this article. Replace sensor if readings are not within specification. Fig. 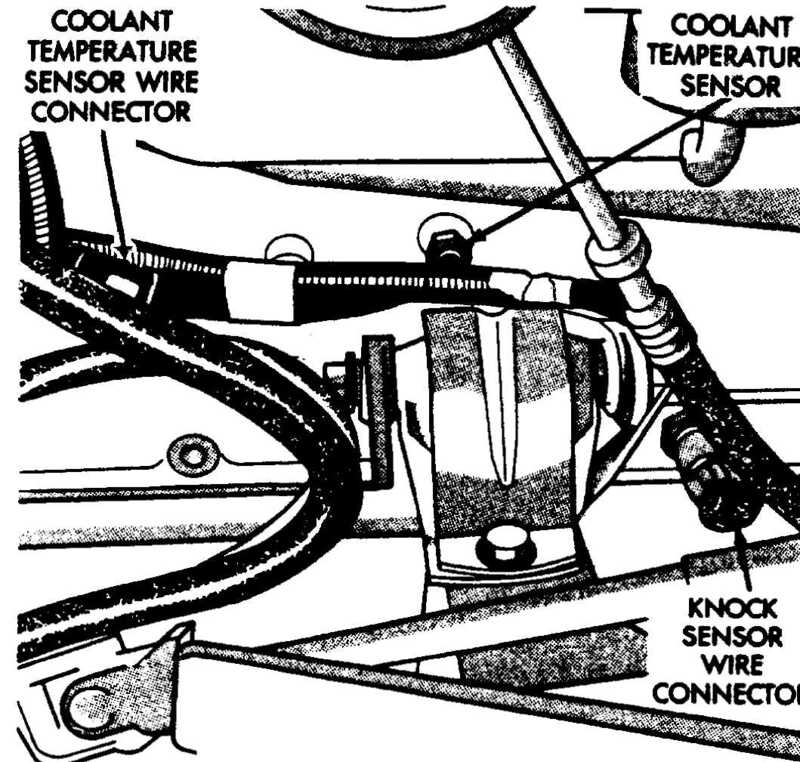 16: View of Engine Speed Sensor Connectors (At Sensor) Courtesy of Chrysler Motors. Spark plugs also malfunction due to carbon fouling, excessive electrode air gap, or broken insulators. NOTE: For this test, an analog voltmeter MUST be used. Blue wire at the distributor connector. wire at the distributor connector. CAUTION: DO NOT remove the distributor connector from distributor. Insert the voltmeter leads into the backside of the distributor connector to make contact with the terminals. 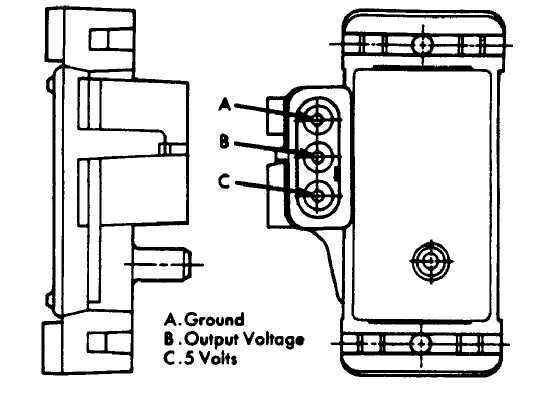 The voltmeter should display approximately 5.0 volts. making good contact. If there is still no voltage, go to next step. distributor connector and pin C-16 at the ECU. If there in no continuity, repair harness as necessary. distributor connector and pin C-5 at the ECU. If there is no continuity, repair harness as necessary. REMOVAL & INSTALLATION below in this article. 1) Drain the cooling system. Disconnect the CTS wire connector. See Fig. 17. Remove the CTS from the left side of the engine block. Fig. 17: Coolant Temperature Sensor (CTS) Connector Courtesy of Chrysler Motors. to 21 Ft. Lbs. (28 Nm). Connect the CTS wire connector. Disconnect the MAT sensor wire connector. See Fig. 18. Remove the MAT from the intake manifold. Fig. 18: Manifold Air Temperature (MAT) Sensor Connectors Courtesy of Chrysler Motors. MAT sensor to 21 Ft. Lbs. (28 Nm). Connect the MAT sensor wire connector. Disconnect the MAP sensor wire connector. See Fig. 19. Disconnect MAP sensor vacuum supply hose from MAP sensor. Fig. 19: View of Manifold Absolute Pressure Mounting Nuts & Vacuum Supply Hose Courtesy of Chrysler Motors. Connect the MAP sensor vacuum supply hose. 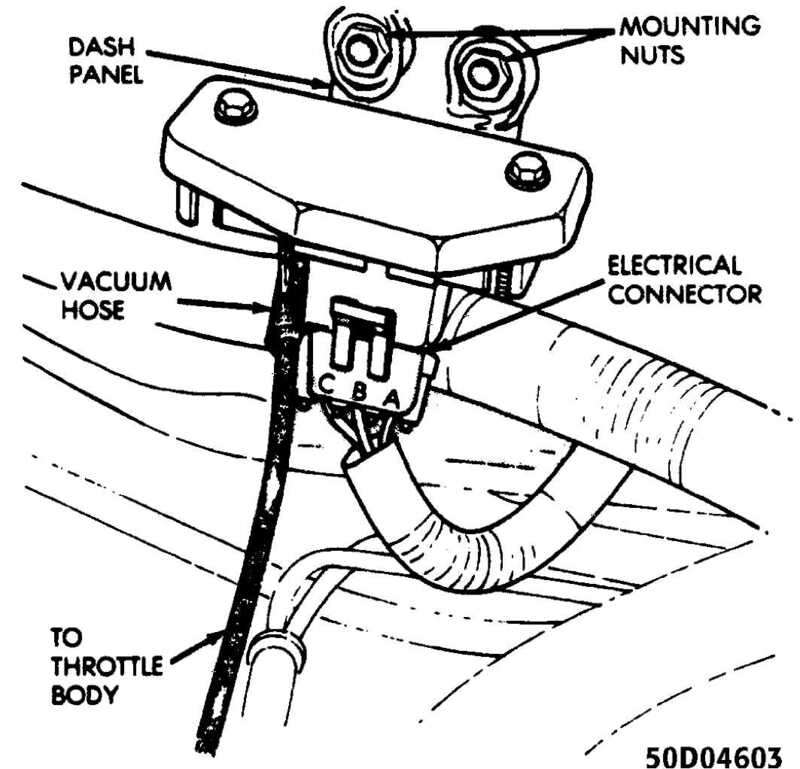 Connect the MAP sensor wire connector. and to the rear of the Coolant Temperature Sensor. See Fig. 20. Remove knock sensor from left side of the engine block. Fig. 20: Knock Sensor Connector Courtesy of Chrysler Motors. WARNING: The knock sensor MUST be tightened to the EXACT torque specified in order to ensure proper operation. the knock sensor to 89 INCH Lbs. (10 Nm). Connect the knock sensor wire connector. Remove engine speed sensor wire connector. See Fig. 21.
attaching bolts. Remove engine speed sensor from transmission housing. Fig. 21: Engine Speed Sensor Mounting Bolts Courtesy of Chrysler Motors. housing with 2 shoulder bolts. Tighten the engine speed sensor shoulder bolts. 2) Connect the engine speed sensor wire connector. The ECU is located below the instrument panel, between the steering column and the A/C-Heater housing. See Fig. 22. 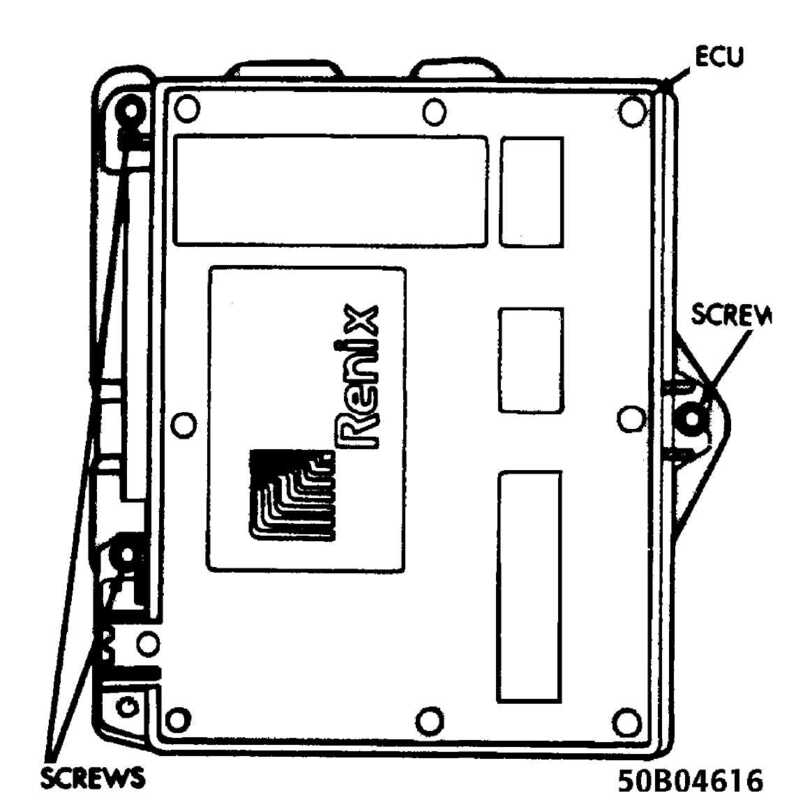 Three screws mount the ECU to a bracket. Remove the 3 ECU attaching screws. See Fig. 23. Disconnect the ECU wiring harness connector. Fig. 22: Location of ECU Courtesy of Chrysler Motors. Fig. 23: Location of ECU Mounting Screws Courtesy of Chrysler Motors. Connect the ECU wiring harness connector. attaching screws. See Fig. 23. 3 Connect the negative battery cable. 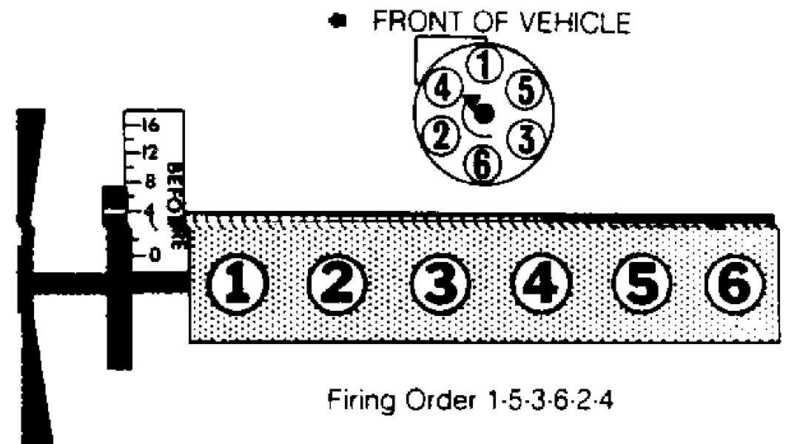 for reassembly reference for No 1 cylinder firing position. vibration damper lines up with zero on the front cover timing scale. The timing mark is located on the edge of the vibration damper closest to the front cover. Fig. 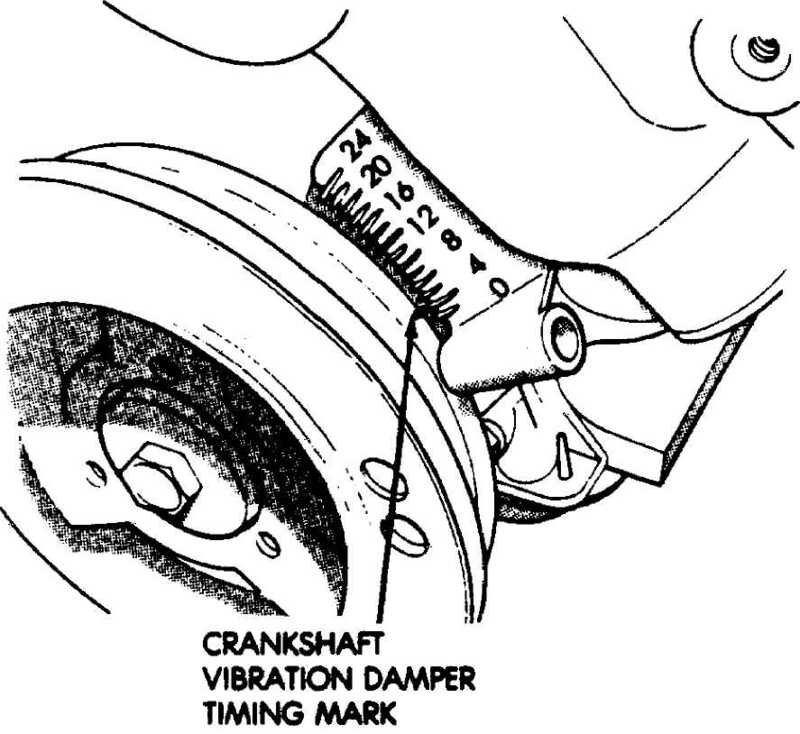 24: View of Crankshaft Vibration Damper Timing Marks Courtesy of Chrysler Motors. 6) Align the trailing edge of the rotor blade with the mark previously scribed on the distributor housing. See Fig. 25. Fig. 25: Aligning Rotor & Distributor Cap for Removal Courtesy of Chrysler Motors. Remove the distributor hold-down bolt and clamp. Remove the distributor from the engine. 1) If needed, use a flat blade screwdriver to turn the oil pump gear shaft until the slot is slightly past the 11 o’clock position. See Fig. 26. The oil pump shaft is located down in the distributor hole. Fig. 26: Aligning Oil Pump Gear Shaft Courtesy of Chrysler Motors. distributor into the hole in the engine block. housing with the hold down clamp hole. See Fig. 27. Fig. 27: Installing Distributor Courtesy of Chrysler Motors. 5) Turn the rotor to the 4 o’clock position. See Fig. 28. Fig. 28: Installing & Aligning Rotor Courtesy of Chrysler Motors. seats, keeping the hold down ear aligned to the hole in the block. to 9.5-14 Ft. Lbs. (13-19 N.m). Using care, disconnect the spark plug and coil wire boots and wires. Twist the boot one half turn and pull on the boot to disconnect the wire. When replacing the spark plug and coil wires, carefully route the wires correctly and secure them in their proper channels retainers. Failure to route the wires properly can cause the radio to reproduce ignition noise, cross ignition of the plugs, or can short circuit the wires to ground. REMOVAL & INSTALLATION above in this article. Position the distributor in a vise. punch and a hammer to drive out the retaining roll pin. See Fig. 29. Remove the distributor shaft from the distributor housing. Remove the stator retaining screw. 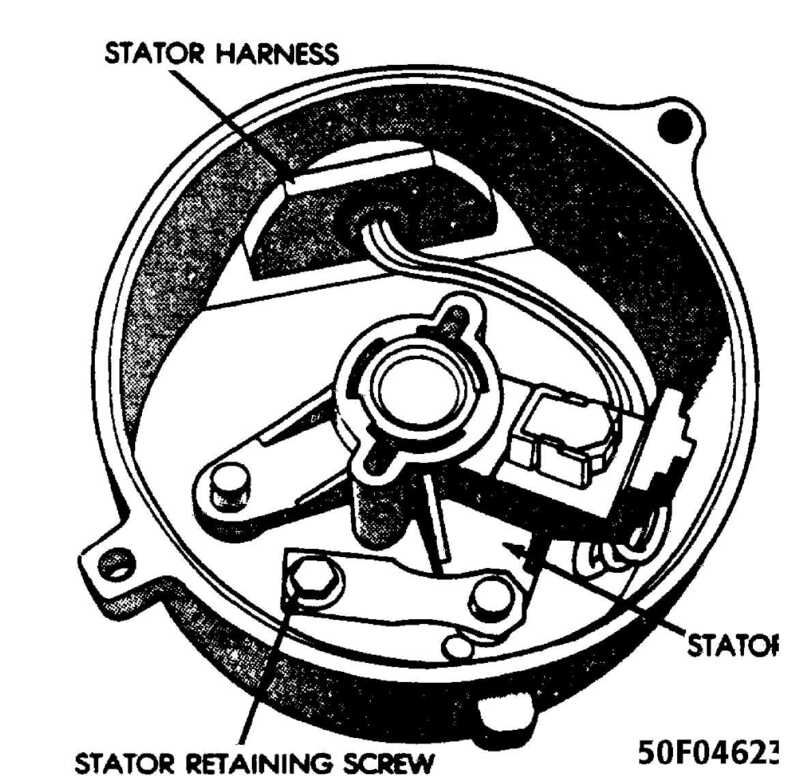 Mark the location of the stator position for reassembly reference. Fig. 29: Removing Distributor Gear Retaining Roll Pin Courtesy of Chrysler Motors. 7) Remove stator harness by pushing the grommet through the distributor housing. Remove stator assembly. See Fig. 30. Fig. 30: Location of Stator Retaining Screw Courtesy of Chrysler Motors. Install stator assembly and the stator retaining screw. distributor housing and push the grommet into position. Install the distributor gear retaining pin.